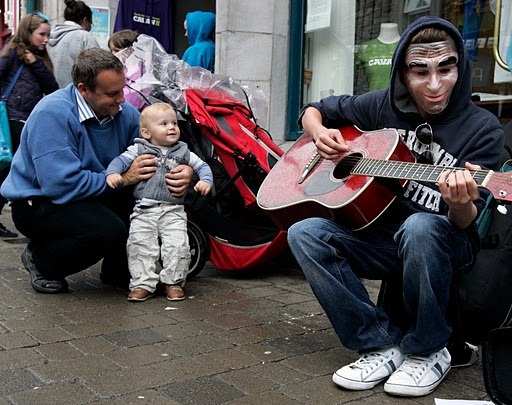 A father and son watch a busker on Main Street in Cavan while attending the Fleadh Cheoil last month. Dublin – On a sunlit Saturday afternoon three counties would meet at 32 Belgrave Square in Dublin inside and outside the CCE Monkstown Culturlann to await a tense decision about where Fleadh Cheoil na hEireann 2012 was to land while a secret ballot took place in an upstairs conference room among Comhaltas Ceoltoiri Eireann’s Ardchomhairle or Executive Council. When all the votes were counted, Cavan Town bettered Ennis in Clare by a single vote and sent the next fleadh back for a three-peat to the Cavan host which had set records the past two years in their stewardship of the second largest festival held in Ireland after the Dublin St. Patrick’s Day Festival. Ennis and Sligo would have to wait for another chance and were encouraged to come back again in a year’s time since they were considered strong suitors for the privilege of hosting an event that is not only a cultural phenomenon, but also an economic one as well. The success of the most recent Cavan Fleadh held in August was still a fresh memory for the voters who were asked to weigh the respective merits (and your correspondent was one of them as a delegate from North America in the interest of disclosure) of the applications from Sligo, Clare and Cavan. Despite the viability and the deep traditional veins of both Sligo and Clare in Irish music, the Cavan Fleadh had too much going for it, bolstered by the numbers that exceeded what was already a historic 2010 fleadh. Crowd estimates by the local tourist office were given as high as 320,000 people over a 10-day span that included events over two weekends, with the largest numbers coming on the last Saturday and Sunday when the music competitions are in full swing and the weather was clear and perfect for filling the streets in fleadh-like fashion. Cavan county manager and chair of the Fleadh Executive Committee Jack Keyes told the Anglo Celt newspaper that the spend over the 2011 Fleadh Festival surpassed last year’s Failte Ireland official tally of $50 million, up to $57 million from the early returns due to the extra days and increased attendance following the significant expansion of the programming from their initial year in 2010. That certainly gave incentive for go for the third year, with commitments for better sponsorship next year coming more readily from the townsfolk who reaped the benefits. Raising the profile of the fleadh is not only good business, but it is rather healthy as well for one of the tenets of Comhaltas in fostering “An Traidisiun Beo” or “The Living Tradition” which was the title used for the 60th anniversary historical exhibit opened at the Cavan County Museum by Minister for the Arts, Heritage and the Gaeltacht Jimmy Deenihan from Listowel , Co. Kerry. Mixing events like the Bardic Awards for long time musicians like the late Gerry Lynch, Paddy Fahy, Ben Lennon, Seamus Devane, Len Graham, Mairead Farrell and Maire Nic Donnchadh, plus a service award to a long-time West Limerick CCE official promoting the music and the Irish language, Tadhg O’Maolcatha, showed the youth around the festival why the music is being handed to them in such a vibrant state. In these recessionary times, the Cavan Fleadh sought funding from sources like the Arts Council of Ireland and the European Union’s Peace III Initiative to produce programming that respected other communities on both sides of the border and beyond, and allowed for a great deal of entertainment to flow for free from Thursday through the fleadh’s close on Monday. f you want to see for yourself next year, the Cavan Fleadh 2012 will run from August 11 to 20 in Cavan Town. And like Paddy Reilly to Ballyjamesduff, you can anticipate a good number of people returning to Cavan.